Firstly, I just want to say thanks to the team behind the Murder mystery, Horror film “Chill:The Killing Game”, for sending me the link to an online screener before its official release date. I have been following this film for over 12 months, so it’s great to finally have seen it, and now to be reviewing it. Chill (as it was previously known), is about a group of college students that take part in the ill-fated game of “Chill”. One player is labelled the killer, and they must pretend to kill the opposition players before their identity is revealed by anyone. The game was originally created back in the 80’s, but after a group of students were actually killed during the game it was banned and long forgotten. Jared Creston (Brad Arner), is a cocky young student who’s sure he can profit from re-creating the game, and turning it into a viral web-series. He enlists his best friend Kyle (played by Roger Conners), to look after all the cameras and edit the footage. Unbeknownst to this new group of players, someone dressed in a black overcoat and a bird mask is slowly killing off the players for real. The group must stick together if they are going to find out who the killer is. The film also stars Kelly Rogers, Jason Orr, Angelia DeLuca and Rick Montgomery Jr. I want to start by saying that this a micro-budget film, made for an estimated $3,000, so please keep that in mind as you read this review. I watch a lot of these types of films so it’s nothing new to me, but don’t count it out simply because of the lack of money. 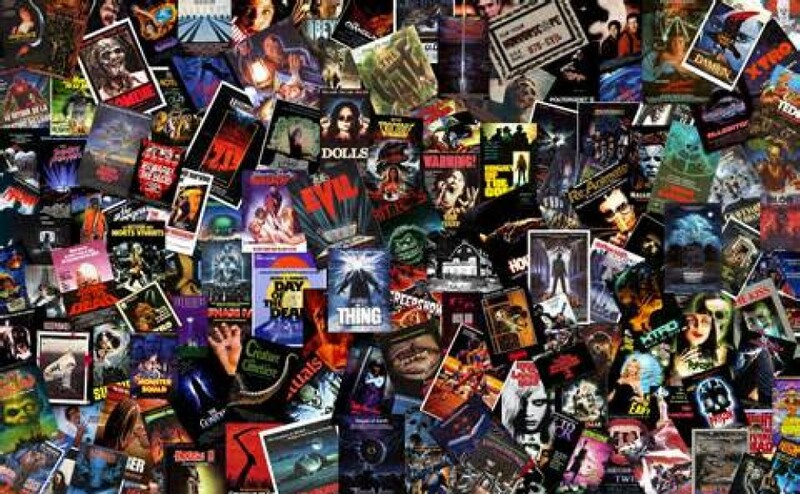 Some of my favorite horror based films have been made for under $10,000, so it is doable if you have a good story and a capable crew. This isn’t an original screenplay but it’s relatively well written, and the production value is pretty good. For starters, I was impressed by the camera work. The shot choices were smart, and they didn’t go crazy with a lot of poor hand-held scenes. Most of the framing in regards to the actors faces was good, and no shots lingered for a long period of time. It’s also pretty well-lit, considering a lot of the film takes place in dark corridors and small rooms. On a few occasions, there’s some shadowing or a harsh glare, but you’d expect that with a film made for $3,000, it would be naive not too. The editing was another thing worth mentioning, the running time is maybe 10 or 15 minutes longer than it needs to be, but the transitions between most of the scenes are solid. There were a bunch of fresh faces in Chill, most of whom have either little to no experience, making the quality of acting all the more impressive. A few of the more emotional scenes are rather wooden, but the general dialogue and back and forth between cast members feels real enough as a viewer. Roger and Brad are arguably the two leads, they give the best performances out of the group. I’d like to give an honorable mention to Angelia, who plays Maddison, one of the girls competing in the game. I found her character really likeable and genuine, she played it with a certain amount of sass and just to top it off, she was rather nice to look at. Most of the kills, or at least the impact of those kills, take place off-screen but that’s not unusual with a micro budget film. What I really respect, is a crew that has a go with the effects, they try to do everything they can to deliver something, anything. I commend the special effects team here, because although the kill sequences were generic and couldn’t be effectively shown due to the budget, they made up for it with gruesome aftermath shots of practical blood and gore. By the same token though, if you can have that kind of detail in your aftermath, Why can’t you have it during the action? Chill is guilty of the obvious hitches or complications that occur when shooting a super low-budget film. The awful inconsistency with the audio dialogue levels, and it’s editing, is the biggest and most obvious failure here. Anyone who’s seen this film knows what I’m talking about. I had high hopes, because some of the audio in the beginning was level and nice and clear, but that doesn’t last long. Making matters worse, was the choice to shoot in a proper college auditorium that echo’s like a church. I probably would have opted for a different location. Simply put, you wouldn’t have the time, nor the resources to spend, in order to edit all that audio accordingly. When characters yell or scream the mic level starts to peak out, it’s not at all pleasant on the eardrums. Keep your hand on that volume button, because you will find yourself adjusting it at least a dozen times throughout this 105 minute running time. A few of the shots also appear to have camera and background noise that wasn’t edited properly. In addition, there are some poorly constructed CG establishing shots of the moon, when it supposed to be late afternoon and not night-time. Also there are a few other continuity issues, but they are mostly small things. The score is pretty standard and doesn’t help build any real suspense, coupled with the fact that a lot of the music choices either didn’t fit at all, or were just arranged in the wrong order. Initially, I thought the idea of shooting home video style footage for the game being played back in the 80’s, was a good one. However, what I didn’t like was that all the players were mysteriously killed, and not only do you not see any of it, you don’t see any aftermath either. It’s a rather bland way to begin your film, considering the large gap between the intro, and the next bunch of action sequences. All the characters were very one-dimensional which made it hard for me to really care about any of them. In fact, for most of the film I couldn’t even remember a lot of the characters names. Kyle and Maddison at least had some personality, but the rest were totally forgettable. 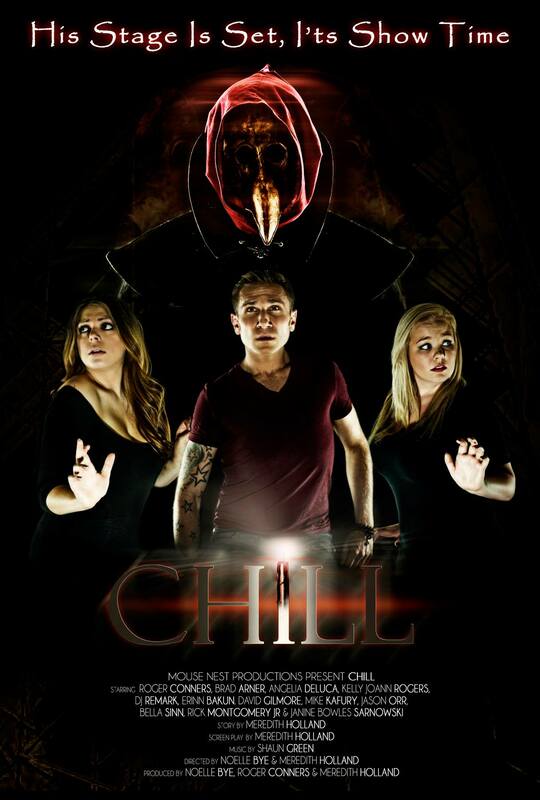 The two most disappointing parts about Chill have to be, the total lack of tension and the on-screen action. Taking into consideration this is a murder/mystery, the suspense is a fundamental aspect that should have been present and wasn’t. 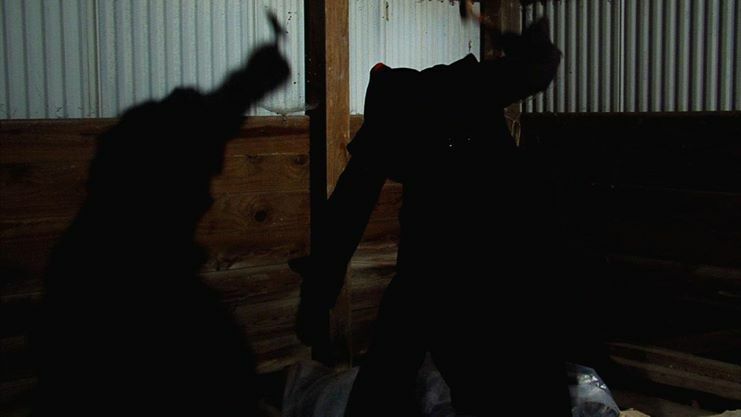 The lack of blood and gore during the action, can be slightly forgiven because of the low-budget. Even still though, I’ve seen films on similar budgets, such as “Blood Runs Cold” and “Porkchop”, that did more with their on-screen action than Chill did. I did enjoy the revelation of the killer so that was something, but the outfit is very similar to that of the killer from both “Scream Park” and “An American Terror”, both of which I reviewed. Honestly, I hope I haven’t been to critical of Chill because it’s actually, decently made and entertaining enough for the genre. Sure, it has its issues but so does your $3,000 car (haha), But it still gets you from A to B, doesn’t it??. I like and admire the enthusiasm behind Chill and that counts for a lot. With a fun and capable couple of leads, some slick camera work and plenty of aftermath gore effects, this one does just enough. Try and ignore the erratic audio issues, and the indisputable lack of suspense and just see the effort. This is clearly a passion project and I’ve never had a crack at trying to make a micro-budget film have you? ?, So who am I to judge?